ive nearly finished my first flamenca build and (hopefully) will glue the bridge on and make the setup next monday. i planned the whole guitar by myself (so no barbero or reyes copy this time) and built it 100% by hand, no electric tools ... okay, lets say 99%, since ive used a drill press for the head slots and the bridge holes, a router for the bridgeslot and a electric bending iron for bending the sides. but thats it, everything else i did with hand tools. 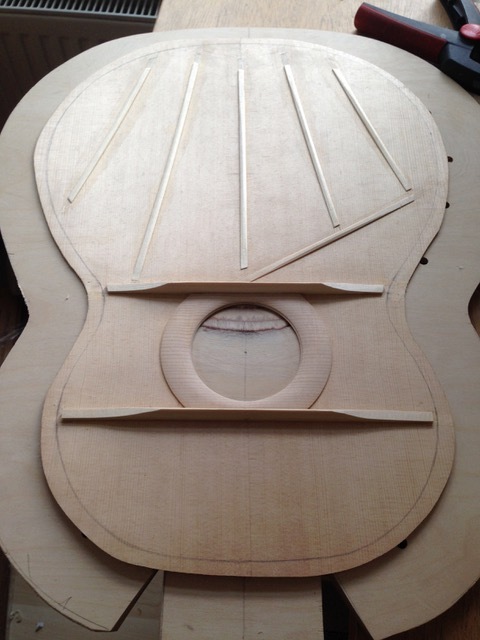 its a sitka spruce top with an asymmetrical reversed five-fan strutting design (which i came up with, when i was drunken 🥴) and a prominent dome (something about 4-5mm) and 1.7-1.9 thickness. back and sides are lebanon cedar and also very thin (thats why the sides look a little bit ugly and unclean in some spots). the whole guitar is smaller than the average (lower bout is about 358mm) and the plantilla i drawn after my own aesthetic ideals (torres and gerundino did inspire me). it has a 652mm scale. the back was very floppy, so it has 4 bars. bridge is brazilian rosewood, which i couldnt bring under 17,4 gram. the weight will come out at about 1200 gram with the tuners. so all in all, a idiosyncratic approach. in didnt make any major errors in the building process and look forward to hear, if the result of this long working process will be satisfying. Do you mean your first build ever or first flamenco? Congratulations either way! Impressive! I truly admire and envy you! Good luck for the build, and please do share pics and possibly also sound samples when you are done! thanks jason and carlos! its my second build. the first was a classical. yes, the lebanon cedar is quite light (similar to cypress in weight). Congratulations. Obviously you have a gift. 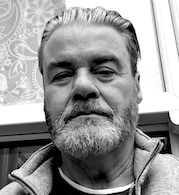 In general I’d like to say that I don’t think it’s a good idea to start with a completely original project: Imho better to lean on the foundations of a solid project before taking a certain direction. I say it by my own experience: my first attempt of guitar (which btw I never ended) was a puzzle of features taken from other luthiers (a plantilla from Hauser and many features of a Kasha guitar, which at the time was claimed superior to everything). After many experiments I realized that for me it was better to start from a successful pattern. Anyway, congrats again and enjoy your guitar. 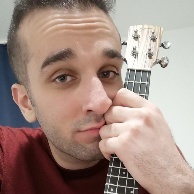 hey echi, from a product oriented point of view your absolutely right: its obviously a good advise to start with a copy of a great guitar (begin with what works) and than make it your own by small changings and observe, what it does. its a scientific approach (although i find, its kind of contraintuitive, for instance, to thickness the wood you work with, after the plan of an existing guitar). ... my train of thought is, that the building process begins with the planning of the guitar (I've learned from my first guitar, that i have kind of an aversion against following the plans of someone else, especially if i don't know the person). there is plenty to learn, when you have to make your own decisions from the scratch and it felt much more organic and right to me, to start there. my approach was not to ecclectically put together some fancy ideas and reinvent the spanish guitar, just to build a sound instrument after my own (traditionally informed) intuition. although i know, that the risk to fail is much bigger, i had to go for it. next week i can tell, if it was a great mistake to do so. i would like to know, what your building biography looks like. how much guitars have you built and what design to you came up with? My first attempts were not as good. They weren’t bad, but not as good. I started as an hobbyist and learnt mainly from books (American Lutherie, Making master guitars etc). Some years later I took some lessons from a luthier and thought also to make a living of it but eventually my life just took other directions. I generally use a plantilla of Santos (actually the same plantilla used by Barbero and Arcangel) with few doming and a bracing quite similar to Reyes. I tried an Arcangel once and have been favourably impressed. Later on I studied quite well a guitar of Manuel Caceres (a copy of Arcangel). In my case I use the bracing of Reyes at it gives a more open sound to it. Alternatively I stick with the design of my old Conde. That’s me. You’ve got a good eye (nice plantilla and well proportioned, elegant rosette), you’re making some smart decisions (back’s a little floppy, add a brace) and your attitude is good (don’t like the first polish, so do it over, even though you want to hear it NOW). That tells me that this won’t be your last build, so even if this one isn’t perfect, you’re on the right path. thank you, echi and rob, for your encouraging words and echi, for sharing. So, yesterday the final moment was there, i strung it up, tuned it and everything was very promising: punchy, loud, fast response, even across the board, action at the 12th fret 3,2mm and 8 mm at the bridge, 9mm at the sound hole (and still room to adjust and go lower) ... everything seemed like i wanted it to be. 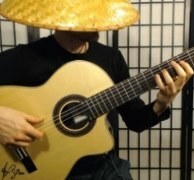 But after 30 minutes under tension, i realized that the soundboard had collapsed, better said: it sunk in some 1,5-2mm, so that it had 9,5-10mm in the middle between soundhole and bridge, 9 at the soundhole and 8mm at the bridge. What a devastating experience!!! 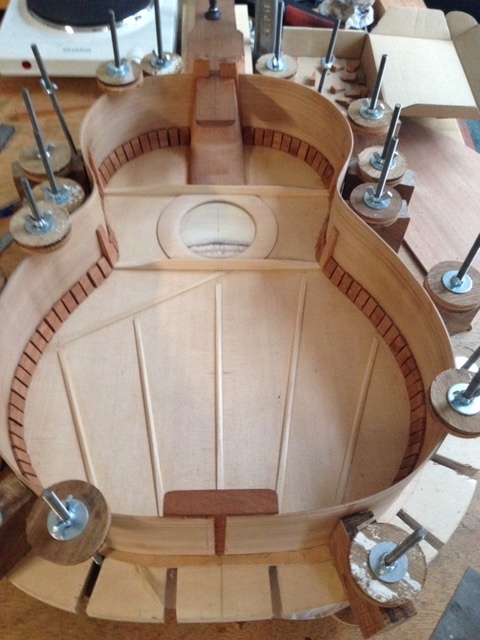 After releasing the tension the soundboard came back and is now nearly flat between bridge and soundhole (where it was domed all the way to the middle of the soundhole before). So, obviously i have gone to far and over the red line in terms of structural integrity of the soundboard. Besides that, i drilled the holes in the bridge too narrow (i took the dimensions from a technical drawing that was not correctly dimensioned), so that stringspacing is something around 55mm, which i know, is much to narrow, but curiously felt not too bad for me, since picado and arpeggios are much easier to play. anyway, that's just on top. before i deal with this issue, i have to solve the more serious one. So i have to correct myself: i made some serious failures. When i handle to get over the paralyzed mood i'm in right now, i have to take action to stabilize the pointed region of the soundboard, which will be kind of a open heart surgery and way over my abilities. so take this as an S.O.S-call: I need to decide, what to do and how to do it and could need some professional help to consider both of these questions (you can see my soundboard on top of this thread). so, any recommendations? Guitar making can be a very satisfying endeavour but it is a certainty that things will happen that can seriously mess with your day. It’s just part of the game. I know you’re feeling terribly disappointed about it right now, but it’s possible things aren’t as bad as they appear. Some tops will collapse a bit then stabilize, there are some pretty famous guitars out there that display this “feature”. It sounds like you can live with the string spacing, so if your top stabilizes OK then there’s not really any need to do anything to it, IMO. I think just monitor the situation and use the guitar as a learning experience. Take some measurements of the top and neck both in and out of tension and see how much things move over the next month. The neck relief might increase a touch and the top settle into equilibrium. At that point the saddle can be readjusted to bring you back to your target action and then phase two, the long term monitoring, can begin. Maybe just start planning for your next build and consider a more traditional approach to the bracing until you get a feel? I think you just discovered why the reverse fan isn’t such a popular design. In time, if you decide this guitar really does need remedial action, then you can do things like adding a couple of stabilizing braces, but doing so now might be premature. It's a learning experience. I was using the router spinning in the wrong direction and it took chunks out of the sides. Then I left it out on a very hot, dry day (for the UK) and the top split. I keep it as a reminder and one day, I may make another. Benros, Man... shocked! I know you are too. You’ve put a lot into this. How flexible was the top compared to the classical you made? And is there any doming under the bridge in its current state? Esscibano, I’ve at least learned from your humidity experience!